Miscellaneous: I Had To Share! 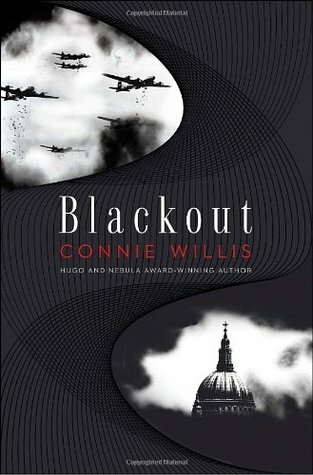 Connie Willis created a beautiful piece of time travel/historical fiction with ‘Blackout.’ Depending on how you want to look at this book it is either the first book in the All Clear series or the third installment of the Oxford Time Travel series. ‘Blackout’ includes characters from ‘The Doomsday Book’ with Colin Templar and Mr. Dunworthy. They are not the stars of this double-decker novel but they do play very important roles. ‘Blackout’ revolves around three historians from the future sent to observe different key events during World War II. ‘Blackout’ is the story of what happens when their assignments end but they can’t get back home. They either can’t get to their drops or they are damaged and won’t work. Oxford should send a retrieval team. ‘Blackout’ is what happens when they don’t show up. I’ve read this and ‘All Clear’ three times. I’ve listened to them and read them and enjoy it both ways. What Connie Willis does extraordinarily well with these books is make the experience of the everyday person who didn’t enlist in the war accessible. During World War II people in London were shop girls, children, and old men. She focuses on the every day heroics of the people who lived at the time and took the famous words of Churchill to heart, ” Keep calm and carry on.” These words that have been appropriated by a new generation were originally meant to steady a people who were sleeping in bomb shelters and waking to find their homes and places of employment bombed. People who would never have been thought of heroes are highlighted as old clerics joining the fire brigade to keep St. Paul’s safe, the shop girls who signed up to become Ambulance drivers and WRENS, children under the age of 16 who were collecting scrap metal and lying to become ARP wardens. Willis paints a realistic picture of rationing and living conditions during one of the coldest, wettest, and bleakest winters in England during 1940. Our historians experience this from the perspective and benefit of privilege. They are from the future where the living conditions and medical breakthroughs make life much easier. They haven’t had to deal with shortage. They are historians and they researched the conditions but research and experience are two different things. They have the advantage of knowing that they win the war but the tables are turned when they can’t get home. There is a fear that they have changed events. What if they did something to alter the course of the war? They become the contemporaries they were studying. Their only hope is to find other historians studying World War II. If they can find another drop site they will have found a way home. I do not recommend this for people with a short attention span, or those who are looking for a light read. It is hopeful, but it is also drenched in data. If you want a light time travel piece I would encourage you to pick up Rysa Walker’s ‘Timebound’ or ‘Just One Damned Thing After Another’ by Jodi Taylor. ‘Blackout’ is a great time travel novel and is a personal favorite. Rarely have I seen an author be able to weave such great fiction around factual history. Usually you get one or the other. If you enjoy historical fiction with the added enjoyment of science fiction time travel this is perfect for you.